A drought tolerant perennial, Aster ageratoides is commonly called the Japanese Aster. Free flowering and very hardy, this is a clump flaring plant well suited to the drier sunny areas of the garden. This is another of those great plant picks that seems to be a little neglected by the industry. It may not be as flashy as some other plants, however it is a great workhorse in the garden, easy care and with colourful flowers. Flowering is from the middle of summer onwards and for us it lasts well past the end of summer, so great for some late colour in the garden border. The flowers are daisy like in appearance and attract bees and butterflies to the garden. 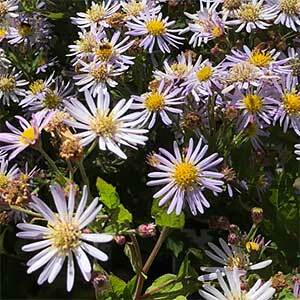 If you can find it Aster ageratoides ‘Ezo Murasaki’ is a brilliant selection. Best planted in good humus rich soil that is well drained. A sunny position is best and once established this is a very low maintenance plant. The natural growth habit is fairly tidy, at the end of the season as the foliage starts to fade, you can prune the plant right back to the base. This is also a plant that can easily be grown in containers where it will provide good colour over a long period as well as access to cut flowers. Propagation is easy by division and also possible from seed. Soil – Best in well drained humus rich soils. Spread – Will form a clump to around .5 metre. Flowers – Mostly violet to mauve, white a purple varieties can also be found. Flowering time – Mid Summer to Late summer into Autumn.